YouTube is unarguably the largest video sharing platform that allows users upload videos and make money from the monetized videos as other users watch the uploaded content. As you may be aware YouTube has over a billion daily views and it offers ample opportunity to make cool dollars. 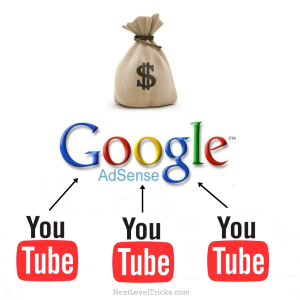 Most webmasters keep asking if Adsense can be linked to their YouTube accounts, the answer is Yes! You can even link more than one YouTube to and Adsense account. Before now, users who own a separate Adsense account were not allowed to link their accounts to YouTube because they both operated different adverts platform. Right now YouTube has changed that policy thereby allowing users with a self hosted account link up their adsense to their YouTube channels. So why not take advantage of this opportunity by using a single adsense account to monetize your blog and your YouTube channels to maximize your revenue. Linking your Adsense to YouTube should not take you much time as it is not really difficult. In fact nobody taught me how to link Adsense to YouTube. -	Before linking your adsense account to YouTube you must be a verified user of YouTube and must have a very good user account standing. If your account is not yet verified you can do so, go to Account> select your country and then select verify using your phone number. -	Next step is for you to link your existing adsense publisher account to your YouTube account. Now go to your YouTube monetization menu and select “How will I be paid?”, and then click on “associate adsense account” and you will be automatically redirected to your Adsense publisher account. Now all you have to do is follow all necessary instruction and your account will be hooked up within minutes. Please note that before you can use Adsense you must be 18-year old and your YouTube channel should be free from copyrighted materials.